The KLX pulls off a neat trick of looking like a full size bike (it is very tall) whilst weighing less than many 125cc machines. Some reviews will say the KLX is heavy at 131KG, but those reviews are comparing the KLX to hard-core offroad bikes. The KLX is a trail bike and in that company it is very lightweight, significantly lighter than the CRF250L which has now sprouted ABS to add a few extra KG. The engine is well oversquare and the power characteristic is that of a tuned two stroke, it needs to rev, indeed given it’s small displacement it is surprisingly harsh at low RPM. In normal riding 5000 RPM is the lowest that can be used. Peak torque is at 7100 RPM and this combined with peak power at 7500RPM means the engine “comes on cam” in a pleasing way from 6500 RPM and pulls strongly through to 9500 RPM, when the power starts to tail off again. It is essential to alter the inlet cam timing. For some reason Kawasaki have left the valve overlap the same as for the KLX300R, which is a screaming competition engine. On the KLX250 this means that the overlap is designed for an RPM which the engine never achieves due to the lower redline. It is easy to add 10 degrees of inlet cam retard by removing the inlet cam sprocket, walking it round two teeth and re-attaching the sprocket using the other set of holes. In fact it’s suspiciously easy, one can almost imagine Kawasaki did it on purpose – maybe the bike won’t pass noise or emissions tests in its tuned up state, but the engineers left an easy back door for knowledgeable owners to unleash the full potential of the bike. The difference is like night and day, in standard trim the bike gains speed, in tuned form it actually pulls. There is a further restriction in that the engine is limited to 6500 RPM in the top three gears. This is easily overcome by joining two wires together and then the engine will rev out in every gear. On road performance in de-restricted form is punchy and enjoyable, within the restrictions of the speed limit there is a lot of fun to be had. In 5th gear peak torque is at 60 MPH so the bike loves hooning around twisty A and B roads. Out on the motorway the bike is less at home but it is certainly not lost. It’s quite happy to run along at 65 to 70 MPH with enough left to pull around middle lane hogs. If I ever find myself frustrated that the bike won’t pull I just have to remind myself about the 7500 RPM peak power and change down a gear – it really needs to be revved to make power. The six speed gearbox has a very wide set of ratios, there is more than a 3:1 difference between 1st and 6th gear. 1st gear is low enough for all standard green lane activities (some clutch slip required when it gets more technical) and 6th is an overdrive gear. In 6th gear 1000 RPM is 10 MPH. There is not enough torque to rev out in 6th gear, the bike will achieve a higher top speed in 5th than in 6th. On A and B roads 5th is the best gear, which covers 40 MPH to 70 MPH, peak torque coming in at 60 MPH, for the steepest climbs into the strongest headwinds 4th gear is sometimes needed and in 4th peak torque is at 53 MPH. Fuel economy is usually around 80 MPG depending on riding style. The fuel tank is tiny, holding only 7 litres, with a warning light that activates when there is 2.3l of fuel left. Given the economy available this typically means the fuel light comes on around 95 miles and then there is 35 to 40 miles of range left. I feel comfortable riding 110 miles between fill ups and I think that is fine given the type of bike the KLX is. The fuelling is perfect, no snatchiness no holes in the torque curve, Kawasaki really seem to have EFI sorted, the Keihin system used on the KLX250 is wonderful. Handling is dominated by the supreme lack of mass, on knobbly or semi-knobbly tyres the KLX can get quite twitchy above 65 MPH, especially in a cross-wind. I have fitted a small windscreen which adds to the instability by acting as a sail which twists the bars in the wind. Cornering and braking are both immediate and quick, again due to the lack of mass. It is possible to ride the KLX in a very sloppy manner, it’s not really necessary to set up for a corner since speed can be scrubbed off mid bend without causing instability. Riding in the wet or the dry is largely the same, sharp corners in the wet hold no fear because the bike is so light there is virtually no danger of sliding out. The only worry about long term KLX ownership is that the next time I ride a “normal” bike I’ll end up in a ditch because I will be expecting it handle like the KLX handles. 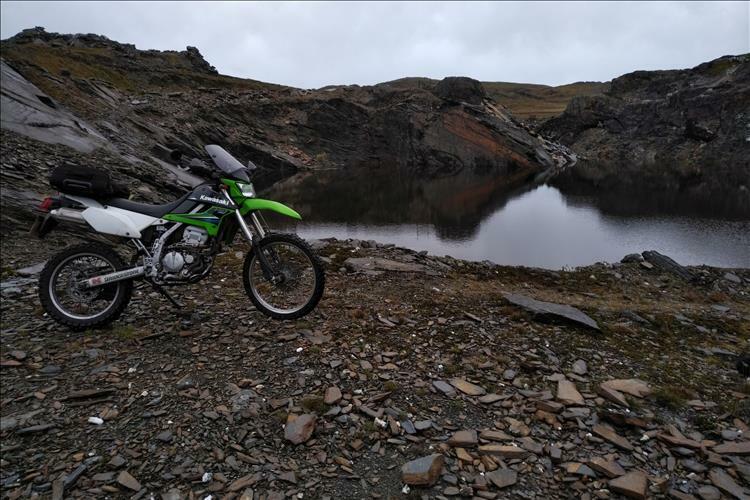 Off road performance is superb, 10” of suspension travel, fully adjustable shock and forks and light weight make green-lane riding a real pleasure. Keep the revs up and it will easily spin the back tyre to help with steep climbs on loose surfaces. Having ridden a CRF250L on three occasions I suspect that the first-time rider would feel that the CRF was faster of the two, an illusion caused by the CRF having more torque available lower down the rev range. Get used to the KLX however, give it the thrashing it wants and the KLX will leave the CRF behind on road and off. Comfort is a mixed bag. The bike is very tall with a good distance between the pegs and seat, which suits my long legs, but the seat is very narrow indeed. It’s in keeping with the dirt bike part of the KLX DNA but it does limit comfort to just an hour in the saddle before I find myself concentrating on my backside rather than the road ahead. I fitted a Sargent comfort seat, which has a wider seat base than standard. The seat is narrow at the front for off road riding but has a much wider rear section, on a long ride I slide back onto the wide section and it is bliss. The pillion pegs are mounted direct to the frame and they are quite high, pillions will need to be relatively small in stature, doubly so because the seat is not overly long. My 10 year daughter is quite happy back there but I suspect an adult would not be. Luggage capability is poor as standard but a variety of racks are available, I fitted a cheap “Alpha Rider” item which adds very little bulk to the rear end yet provides a very secure and stable base to strap down my 35 litre airport bag. The rack also provides several much needed hand-hold points for manhandling the machine around. Instrumentation is comprehensive for a trail bike. An LCD instrument gives RPM, speed, a clock, odometer and two trip-meters. Warning lights include fuel, temperature, neutral, high beam, indicators and EFI. Strangely there is no oil warning light, but the level is easy to check as there is a sight glass in the clutch cover. No oil should be used between changes. Servicing is easy, the oil capacity is only 1.3 litres which I use as encouragement to change the oil every 1000 miles. The manual states 6000 miles but that seems like a very long time to leave oil in a hardworking engine. All the cycle parts and suspension are pretty standard stuff, changing the fork oil in USD forks is always more involved than for conventional forks but well within the remit of the home mechanic. Valve clearances are shim and bucket which brings the benefits of long service intervals but also the extra work required when the clearances do need to be changed. The air filter is washable and the fuel tank is no more difficult to remove than on a pre EFI machine, just one electrical connector, one fuel hose connector and two breather pipes. Healtech make an interface which plugs into the diagnostic port under the saddle. Connected to a USB port on a laptop this enables full EFI diagnostics to be performed. It’s possible to read all sensor input values, run the fuel pump, activate the 2nd air solenoid, active the cooling fan and more. When I buy an EFI bike I always run a diagnostic to check for issues and in the case of one of my KLXs the Healtech revealed that the cooling fan was non-functioning. It had seized and blown the fuse. I assume a previous owner had made merry with the jet-wash and water had got into the bearings. A second-hand fan from an internet auction site cured the issue. For those who don’t want to invest in an interface there is a basic diagnostic function built into the bike, by connecting a wire to ground the ECU will flash the EFI warning light to indicate fault codes. 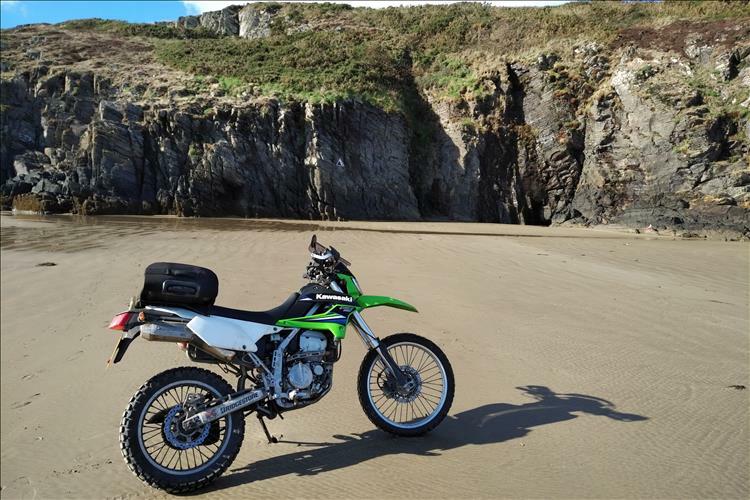 The KLX250 was discontinued in the UK when Euro 4 came into force, but launched as a new model in USA in 2018 so parts supply is as good as for any current model. My KLX250 in its tuned state is enough bike for everything. It quite happily cruises for hundreds of miles on the motorways, carves through traffic, careens down green lanes. It’s light enough to ride in the snow and ice, it’s stone reliable, good on fuel, cheap to tax and insure, extremely easy to work on and massively involving and fun to ride. Nice review. I've always liked these but was always put off with the fact it only had a few more hp than a 125. Can't understand why it was potentially restricted as I think it's the same engine as in the z250sl which puts out about 25hp. The Z250SL is something around 27bhp. I have zero idea what the cam timing is though but I know Sharon's Z250SL goes very well considering it's humble capacity. I also consider it to be pretty grunty with power everywhere you need it. Journalist reviews say it's revvy but I've not found that at all. I'd like to dyno the KLX now it's tuned - I suspect it's closer to the Z250SL now. I mentioned the tendency to instability in the review, I don't want to overplay it as many lightweight trail bikes get a bit squirrely at high speed, but I wonder if that is why the bike is so restricted as standard. In standard trim 65MPH is your lot because it won't rev above 6500RPM in 4th, 5th or 6th. I ran the KLX standard for a couple of months and it was OK but I was always having to make excuses for it and selecting routes which didn't include steep hills and overtaking wasn't an option. Now I can blast around anywhere and whip past dawdling cars on the A roads. What ever the reason it was clearly a conscious decision by Kawasaki to restrict this bike if it won't rev out in the top three gears. But it sounds like now after the mods it's the bike it should have been from the crate. One thing I forgot to mention is that I've changed from O ring to non-O ring chain. The difference in smoothness and performance is wonderful. I have a Scottoiler which I usually have set to "Exxon Valdez" level, from the adjustments I've had to make I estimate the non-O ring chain will last probably 1/2 as long as the O ring version but since the non-O ring chain was 1/3 the price it works out better. I had constant chain problems with the KLX when it was running O ring chain, lots of noise and graunching, all cured now. Where can o get my 2009 KLX250 de restricted. I live near Portsmouth UK. Link out the clutch switch and change the cam timing. If you're not confident to do it yourself go to a non-main dealer motorcycle shop and get them to do it. I'd guess at a maximum of 2 hours labour for the work and no parts will be required. Use the attached image, if your chosen mechanic doesn't understand it then don't let them work on your bike. Look up "Marcelino Cam Mod" - there is a lot of information out there. Don't alter the exhaust timing. I've tried mine with the just the inlet altered and then with both inlet and exhaust altered and it's much better with just the inlet altered. It will completely transform the bike. I'm questioning my CRF250l purchase now. To clarify, you drop the inlet sprocket off the cam and walk the chain 2 teeth around the sprocket so that the "IN" timing mark on the left disappears below the head and then pop the sprocket back on the cam. You will then see that the threaded hole in the cam is now very nearly aligned with the "EX" marked hole in the sprocket (it was aligned with the "IN" marked hole before). You then rotate the cam a tiny bit to properly align the threaded hole in the cam with the "EX" marked hole in the sprocket - this is where the 10 degree inlet retard comes from. Finally, tighten the sprocket and torque down the bolts. That is it. You will need to link out the clutch switch otherwise you won't be able enjoy the effects of the mod because the engine will not rev beyond 6500RPM. Glenn, the CRF is a fine machine - I very nearly bought one (very nearly bought two actually), it was a test ride on a CRF250L which opened my eyes to the idea of running a 250 as my only bike, I'd always had 600 and 650 singles previously. In the end I bought a KLX because it was cheap and I didn't know if my 250 experiment would work so I wanted to limit my investment. I have to say that for normal road and green lane use "out of the box" the CRF is the better machine, it's certainly more comfortable and doesn't require any mods (as far as I'm aware) to make it every day useable. But, mod a KLX and for me it overtakes the CRF, it's lighter with better (fully adjustable) suspension and the little engine turns into a proper Kawasaki screamer. I find the maintainence is easy, the bike is a real pleasure to work on too. I've got five KLX250s now, one has only 800 miles on it and looks like it just rolled out of the factory, that sits in the corner under a sheet with superplus in the tank and battery tender. The one I ride daily has just passed 19000 miles, 6000 of those in my ownership (since October) and it starts and rides like new. How? I like 'em that's how! I admit I may take having spares further than most but I am convinced that having more than one of the same bike is a good policy. My daily rider recently popped a fork seal, I had the choice of fitting a spare fork or riding one of the others whilst I waited for the seal and the seal driver to arrive. Several times is't paid off for me. I ride all year round, several times a week and I can't be without a bike. I have in the past persued the idea of having a big cheap bike to cover the miles and save my favourite bike for Sunday best, but my favourite bike is my favourite because I like riding it. What would be the point of riding a bike I don't like to somewhere I want to be and then not being able to ride my favourite bike when I get there? In my fevered brain this all makes perfect sense - I have so many KLXs because I ride a lot of miles and it's a small engine, which with the best will in the world isn't going to last as long as a 750 (although Ren's exploits with the 125 might speak otherwise) and they're not available new in the EU any more so I wanted to ensure my continued enjoyment of the machine. I'm still in love with it, I browse Ebay and Autotrader and visit the bike dealers and I haven't seen anything else I'd rather own. Yesterday I took a test ride on a Versys X300. It was interesting, the Versys didn't pull as hard as my modified KLX. It's top speed was higher because it pulls for longer through the rev range but it's incredibly low geared spinning at 7000 RPM for just 60 MPH. There's a long 1:4 hill near here that I use for testing bikes, going up there the Versys wasn't able to hold more that 60MPH which is exactly the same speed my KLX will hold. The difference is the KLX will do it at 8000 RPM in 4th, the versys was over 10000 RPM in the same gear. 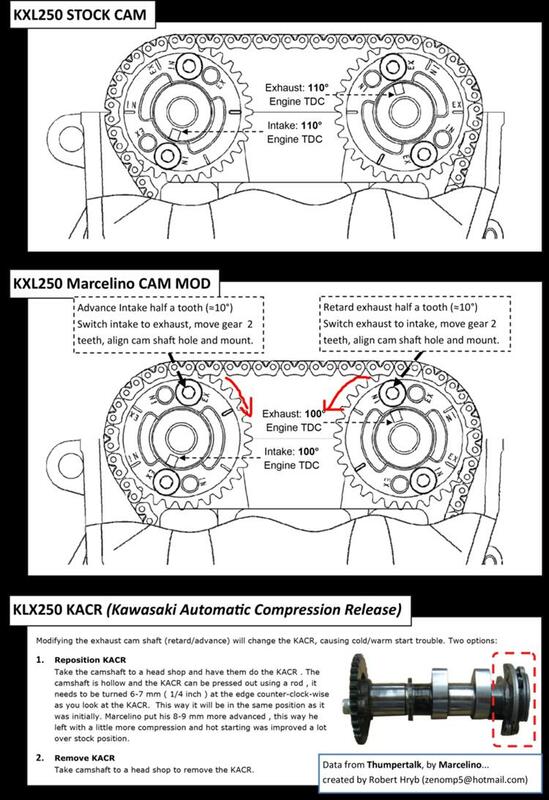 So given that the standard torque figure for the KLX and Versys are roughly the same, this is confirmation for me that the modified cam timing definitely increases torque on the KLX, it has a good strong midrange that's lacking as standard. The Versys in comparison felt quite weak, it was a pleasure to get back on the KLX for the ride home. The Versys shares the same engine as my z300 be they are a rev hungry little number and 70 comes up at around 8000rpm. I wouldn't call it was lacking in torque but I have spent a lot of time on two strokes. What would be interesting would be a Dyno graph between your klx250 and the z250sl like Sharon's which doesn't appear to have any of the restrictions that the klx has or had. I've reviewed the Z300 on here and I agree, it's a revvy motor. I don't know if Kwakker changed the engine or mapping etc to alter the character of the motor on the Versys 300, but having seen reviews and your thoughts Bob it seems not. When Kawasaki released the Versys I was surprised they used the 300 twin rather than the 250 single, that would have been my choice. In spite of our opinions it's also worth noting not everyone thinks like us! Keith m - are you loving your Z300? The main thing for me was the ridiculous impossibly low gearing! 1st gear was all but useless. I'd be looking to drop a couple of teeth (at least) from the rear sprocket, assuming the electronics would allow it. The engine was very smooth and did make power across a very wide rev range, but I couldn't use it because I had to hook another gear. I was in 6th gear at 40MPH. This spoils the bike for me. Another thing and this is just down to my attitudes, but the KLX and the X300 have small engines. Sooner or later your small engine will run out of shove when faced with a steep hill and/or headwind. When the KLX runs out of puff I don't mind because it is such a small and lightweight trail bike, I tuck down against the wind and grind up the hill. Now, the X300 doesn't look or feel like a small bike, it doesn't weigh like a small bike either and with it's large fairing and windscreen it seems to me it's attitude is "writing cheques the engine can't cash" so when it runs out of power it feels much worse. On paper the X300 has 19 odd HP over the KLX so I don't doubt that it'll cover ground more quickly, but I can't ride along at 8000RPM everywhere. KLX might have an edge, but is not realy an option in DK as there is simply not enough on the second-hand market, but I consider the CRF250L as it has become some new kind of "classic" already, hundreds of them are seen touring the world, with great success, the production still holds up, also in this part of the world, spares and support will be VERY long, no need to secure with extra bikes and parts for many years to come, in no way pefect, but just a damm good and universal bike still,.. Both Inazuma and DL250 got a very comfortable seat, good luggage options, and might be better fit for very long road trips in Norway and Sweden, very remote locations, on the buttomline, compared to both KLX and CRF,..
What I consider right now is to get rid of the KLE500-project also, its been two years delayed already, and then maybe only have one single DL250 for longer road trips, and a maybe, just maybe, an older CRF250L for smaller trips 2-3 days plus joy-rides in the local forest, (when the Hyosungs are worn out that is),.. Size is a funny thing. The problem as pointed out is the KLX and CRF are both light bikes but the price is skinny seats. The Versys 300 and Strom 250 are (relatively speaking) huge, fat and heavy. The advantage is there's a proper seat (although the Versys' seat is very hard) and there's spaces and places for luggage. 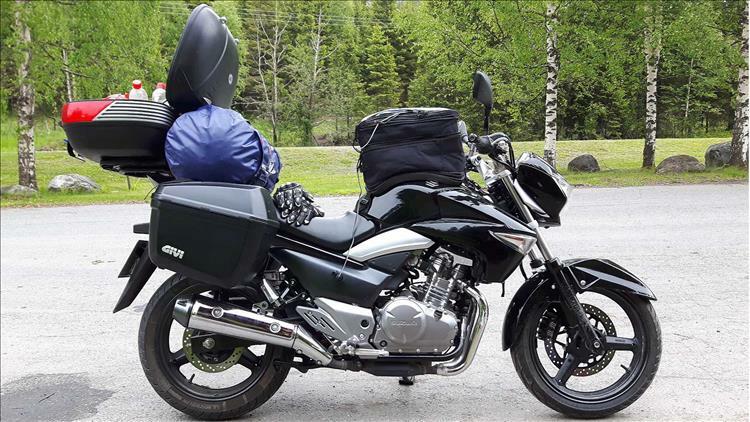 In a perfect world a motorcycle would be as big as a GS1200 for luggage, high speed stability, and comfort. As small as a KLX125 for ease of use, economy, and off road ability. It would have a smooth V8 engine that has the torque and simplicity of a single. Everything is a compromise. Manufacturers make a selection of bike, each on compromised in some way. It's up to us to decide what compromises we make - hence the bike we choose. Now - if we could get our heads together and create this perfect motorcycle we'll all be millionaires. Then we can all retire and ride around on our perfect bikes! The KLX250 standard saddle is horrendous - absolute torture. The CRF250 saddle is typical Honda - very comfortable. I have fixed the KLX with a Sargent saddle but it cost me £340 do it. As I said in the review I think the CRF is the more complete bike out of the crate, if you want to just buy and use a bike without messing then the CRF is better. For me it's all about weight, if that Versys was 145KG I wouldn't be complaining. As it stands it feels like my old KLE500 but with half the power and hence a bit lackluster. I did have a test ride on a CBR250R and that was much better, mainly because it was lighter but you're still left with the proposition of struggling up a steep hill but this time on a "sports" bike, which seems even worse. I guess what I mean is that I can forgive the KLX it's shortcomings because nobody expects a trail bike to be fast on the motorways, whereas the Versys et al kind of look like they ought to be but aren't. My seat of the pants dyno says the KLX is now over 20ftlbs and probably 23-24Hp, compared to 17ftlbs and 21HP. It feels even better because that torque is available from 6K to 9K RPM which in 5th gear gets you from 50MPH to 80MPH - perfect for "normal" roads and if I want I can potter around and never need to go over 7K. Oh yes, I forgot - Henrik, you mention fuel range. That is a big issue for the KLX. Ren. Yes still loving the z300. The only thing I would change would be the seat which seems devoid of foam. The standard KLX seat is unusable. The KLE500 I used to have had a hard seat on slope so it was like some kind of coccyx battering instrument. The Versys X300 I rode the other day had a plank (or at least it felt like it) where the seat should be. The Sargent seat I fitted to the KLX was the best £340 I've ever spent. Yeah the seat on Sharon's Z250SL ain't exactly "plush". Sharon's OK because she's not heavy enough to trouble even the thin padding. BTW I vaguely seems to remember there is a oversize tank available to KLX250 from acerbic or IMS,.. Regarding the fuel tank issue, isn't it the case that they're never big enough. I think I've got about 6 gallons available to me but at brisk Autoroute pace I'm still looking for fuel at about 200 miles and sweating at 240. I think it probably gets easier with age, who can ride that long without wanting a coffee and a pee. Not me. Also if you have a tank in the normal position it can get very top heavy, luckily mine is under my arris. I know riders of ST13's which have a two part tank regularly remark on the top heavy feel at low speed. Ya'll need a CBF125. It holds around 13 litres which is good for a 125. It also returns good economy hence it has a 300 mile tank range - easily. I have managed 350 miles before I too was "sweating". Ed, whether or not yours is big enough is really not for you to decide. Anyway, can't stop, I've got potatoes to plant........and a Pan in the garage that requires a bit of graft. Still waiting for a new bottom hose from Silvers.